First published Canberra Times, 26 November 2014. The thing that’s so lovely about these warm, summery evenings in Canberra is the gorgeous luminous light that highlights the bright, new soft leaves of the trees. I believe we appreciate our seasons, as they are so incredibly extreme. This association with light, summery evenings, easily translates to serving lighter, fresher foods incorporating the new seasons delicate vegetables, so easily accessible here. Tarts are perfect for entertaining and ideal fare for Christmas celebrations as they can be served warm on plates or passed around as finger food. This particular tart is reminiscent of the French bistro classic, Nicoise Salad, however instead of serving it with tuna, I opted for the richer, more decadent flavours of salmon. 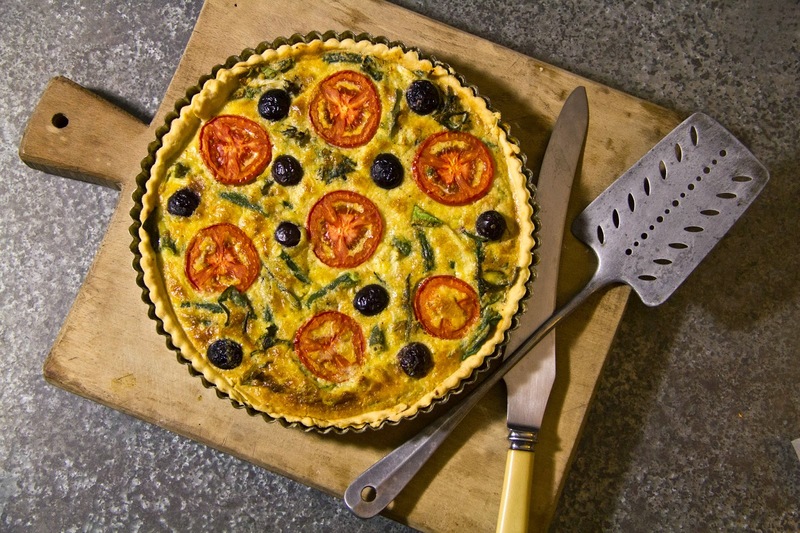 The tart holds up well for left-overs and can be made a day in advance. The beauty of a tart is that you can prepare and par-cook the tart shell in advance and the filling combinations are endless. This tart was served alongside the wicked and indulgent Rosemary Monkey Bread, swimming in butter and honey. Place the flour, butter and salt into a bowl. Using your fingers, rub the flour and butter together until it resembles course breadcrumbs. Add six tablespoons of ice-cold water and mix with a knife until a dough forms. Transfer the dough to a lightly floured surface and knead it until smooth. This should take about two minutes. Form the dough into a disk and wrap it in plastic wrap and refrigerate for an hour. Boil the potato in salted water until tender, then add the green beans and cook for a minute more. Using a slotted spoon, transfer the vegetables to a bowl of ice-cold water, then drain and place in a medium sized bowl. Add the lettuce and salmon to the vegetables and set aside. Blend together the milk, cream, oil, mustard, eggs, anchovy, garlic, shallot and salt and pepper until smooth and add to the vegetables and salmon. Stir to combine and place in the fridge until ready to use. Roll the dough into a thirty-two centimetre circle and transfer to a greased twenty-six centimetre spring form tart tin with a removable base, pressing the dough gently into the base and sides of the tin. Place the tin on a baking tray. Prick the dough with a fork and cover with parchment paper and fill with dried beans. Bake until slightly firm, about fifteen minutes. Remove the paper and beans and spread the filling into the crust. Arrange the tomatoes and olives on the top and bake at a reduced oven temperature of 150C for approximately thirty minutes, this may vary and take longer depending on your oven. Check for doneness in the centre of the tart, it shoudl not be runny. Let the tart cool slightly before removing from the pan to serve. 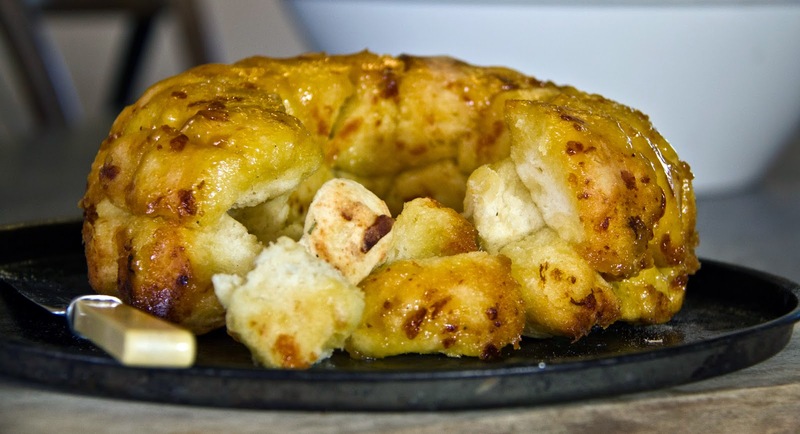 Grease a twenty-five centimetre bundt tin with butter and then dust well with flour. Whisk the flour, cheese, rosemary, salt and pepper in a medium bowl and set aside. Heat two tablespoons of the butter with the milk and one-third of a cup of water over medium heat until warmed. Do not overheat the milk as you will damage the yeast. Transfer the milk mixture to the bowl of an electric mixer fitted with a dough hook attachment. Stir in the sugar and yeast and allow to sit for about ten minutes until the mixture is foamy. With the motor running slowly add the dry ingredients to the yeast, beating until the dough is smooth. Transfer to a lightly greased bowl, cover with cling wrap and leave in a warm place for about an hour. Melt the remaining butter in a small saucepan and whisk in the honey and set aside. On a lightly floured benchtop, pat the dough out into a twenty centimetre square about two and half centimetres thick. 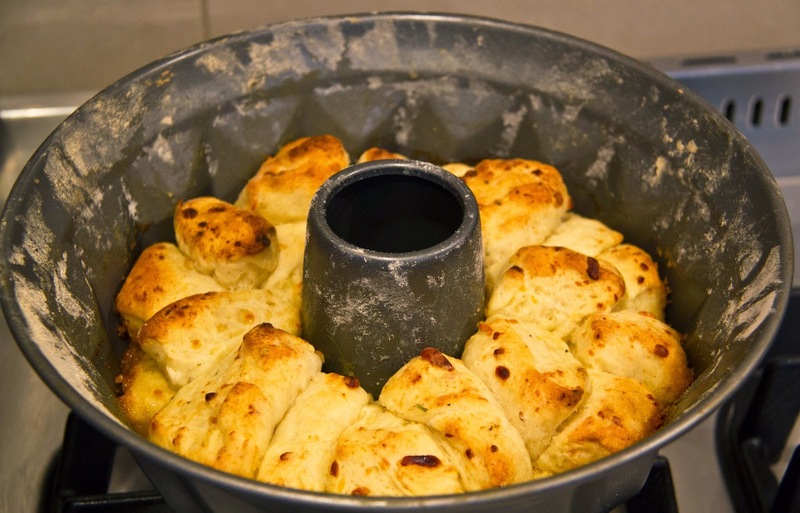 Cut the dough into two and half centimetre pieces and squash together into the prepared bundt pan, layering as you go. Pour the melted butter and honey mixture over the dough. Bake until golden and a skewer, when inserted into the middle of the bread, comes out clean. This should take about thirty minutes. Let the bread cool slightly before upending onto a plate and serve with the Nicoise summer tart.